All In One System Rescue Toolkit 2017 is a new version of the system analysis and repair toolkit that combines Live CD functionality and Windows tools. We reviewed the initial release version of the All In One System Rescue Toolkit back in 2016, and found it to be a great tool not only for professional support technicians but also everyday users who want access to an assortment of tools that they can boot or run directly. The new version of the toolkit is already available for download on the main project website. The full version has a size of 665 Megabytes, and can be downloaded using BitTorrent, or various direct download servers. You can burn the ISO image to an optical disc or use it to create a bootable USB drive. Another option that Windows users have is to mount the ISO directly to run the Windows compatible tools, or extract the ISO image to do the same without mounting. The tools collection ships with a Live CD part that you can boot, and an autorun part that you can run directly on Windows machines. The Live CD distribution was changed to Lubuntu 16.04.2 LTS base for faster booting and lower memory use. Several new tools were added to that part of the toolkit including the document viewers Abiword and Gunumeric, a boot repair tool, ClamAV antivirus support for scanning for threats in the Live environment, and system profiler and benchmark information. The Live CD requires 64-bit CPUs for EFI support. The Windows tools collection does not support Windows XP or Windows Vista anymore due to Microsoft ending support for these operating systems. While that is the case, most tools will continue to run just fine on those systems. Probably the biggest feature functionality wise is the new download cache. All In One System Rescue Toolkit 2017 will use the USB storage for caching purposes and put downloads in the extras\cache folder. This means, among other things, that the application will use the cache when you run tools and not download data from the Internet if a cached copy is available. Another change is that the application does not change the system wallpaper anymore. It displays an overlay instead that lists system, hardware and networking information directly on the desktop. All tools were updated to their latest version. Troubleshooting icons for CPU, RAM and Hard Drives added. Tasks are ended using several methods now so that automated tasks won't get stuck. Removed programs: Eset SysInspector, WinMTR, RoboCopy GUI, FreeCommander. The Autofix feature has a new "diagnostics only" mode which checks but does not run any repair operations. All In One System Rescue Toolkit 2017 improves the technician's toolkit in a meaningful way. 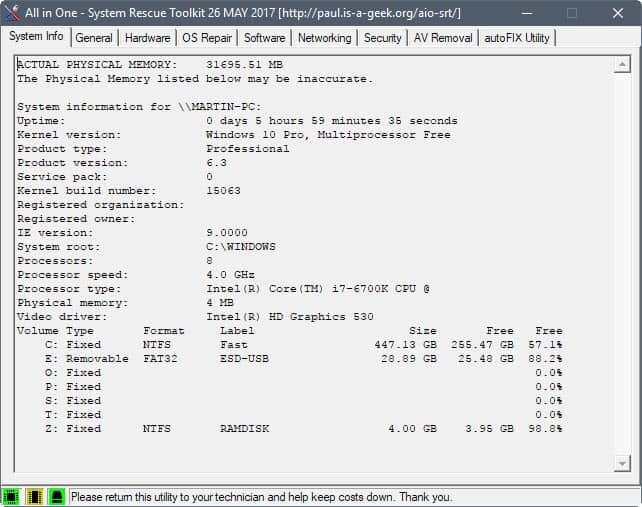 It is still relatively lightweight compared to other solutions -- GeGeek Toolkit has a size of more than 1.6 Gigabytes for instance -- but that is largely because of a concentration on a limited number of repair and troubleshooting tools. No one is keeping you from adding tools to the toolkit manually. While you won't be able to run those tools from the interface, they are still available nevertheless if you do so. Now You: Do you use a toolkit collection for repair and troubleshooting jobs? Windows Repair – supports Win XP to Win 10. Technicians Toolbox – supports Win XP to Win 10. When I have to use the tools, I find them very effective. Can you add more screenshots? It can help visitors to understand more about this software and its functions. Hey martin can you help me suggest good permission tool resolve all the issues with file permissions ? i tried changing permission settings but it aint happening it goes to default settings. Cannot you use a program like Take Ownership to regain access? Richard i have that but there is something going wrong.i am assuming i might have messed with permissions with my windows drive. can you help me go to default permissions on all drives? @martin – no none of the app are working . Dude went with an older version of Linux to make it faster. I pretty much have to try this because that sort of conscientiousness is kinda rare in such a solution. Down with unneeded bloat! Also: this has Clonezilla and GParted on it, making it a whole lot like that paid Parted Magic, only free. Kickass. Thanks for the heads up, relevant to my interests! i actually used latest ubuntu since i was not able to boot windows (mot even safe mode). I dont understand how to download this from that url. I Technician Version and select English, and there is no download, I scroll down and I see a torrent link when i click it nothing happens?! The linked resource, the one in the summary box, lists torrent and direct downloads. I didn’t scroll down far enough, lol. One of those days. Where do I download this? The link to the project is in the summary box below the article.